Frequently asked questions answered by Bethany with a little help from daddy. Q. Is the baby represented in the book a boy or girl? A. This is our most asked question. We really do not know. It is a boy or girl. If you think he is a baby boy, he is. If you think she is a baby girl, she is. This helped us to not have to make separate boy and girl versions. The last illustration does show a boy and girl. Which was represented in the main illustrations? Hmmmmm. I dunno. Neither does daddy or Mentol. Q: You put "quotes" around the text on the page with Jesus represented. Is this a direct quote from Jesus? A: No. We can only imagine that Jesus would be inclined to say something so sweet and loving to a tiny baby. 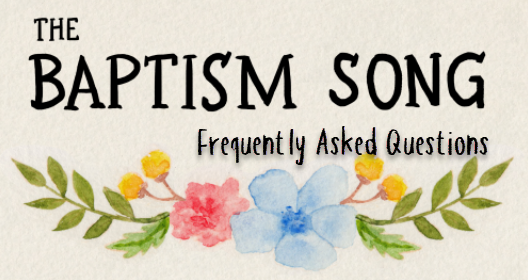 Q: Did you write The Baptism Song & Baby Dedication Song? A: No. Daddy wrote it while my mommy was pregnant with me and Christian. (Hunter was born 14 months later.) He wrote both, because we have friends who have Baby Baptisms and others who have Baby Dedication ceremonies and everyone deserves such a beautiful song of hope and love. Q: Bulk Purchase - A church leader wrote and asked, "We want to include The Baptism Song Book in our baby's Baptism gift boxes. If I need to buy a lot of Baptism Song Books for my church, can I purchase them in bulk at a discount? We are singing The Baptism Song at each of our baby Baptisms." A: First, hooray, we can't wait to hear the story and see the videos. Daddy says if you need to purchase a bunch for your church, you can easily sign up for a Create Space Direct account HERE. We have heard that it works great and the books don't cost a lot. Amazon own Create Space and it connects to your Amazon account. Q: How did you find Mentol to create your illustrations? A: Daddy and I were looking for the perfect illustrator all around the world. We found this illustration and knew that Mentol was perfect for illustrating The Baptism Song book. Q: What is your feeling about Baby Dedication versus Baby Baptism? A: Wonderful! We love any and everything that brings families together in celebration of Baptism and dedication of a baby into their family's Christian faith. The Baptism Song does say of the parents and godparents - "I'll carry you til you can walk. I'll speak for you till you can talk. I'll hold your hand and never go away. This I promise today." We believe this is a promise that I will assist you, speak for and guide you until become mature and are able make your own decisions. I will always be there for you and you can trust me. I'm just a pre-teen, so you probably know more, but sometimes simple is more. ​Q: Can Mentol create illustrations for me? A: You may email her or friend her at her FaceBook page. She will communicate with you soon. Q: Are you going to make versions in any foreign language? A: We are planning versions in Spanish, Portuguese, Russian, Filipino, Mandarin, and others. We already have people and groups who asked to translate The Baptism Song Book into Mandarin Chinese and Spanish. Let us know if you would to translate The Baptism Song Book into your native language. Thanks. Q: You are only 11 years old. How do you know how to do all this? A: Mommy and daddy make it fun for us to learn. I learn a little bit more every day. It is fun. We made over 150 pages of notes with Mentol. She has been very sweet, supportive and helpful teaching me how to be an art director and how to keep my art studio neat and organized. A: We love to communicate with people from all around the world. Update: I just signed as Art Director for wonderful author who wrote a real fun children's book. The first in a series! Hooray. It's still a secret, but I'll let you know more soon. Q: Will you be offering a hardcover version of The Baptism Song Book. A: Yes. Daddy is working out the last parts needed. We will announce it soon. A: I like all my classes. If I had to pick a favorite, I would say that my language arts and art are my favorites. A: Click HERE to see me and my family. Q: Is there really a Baptism Pier? A: Click HERE to see it. Mr. Lew Made it for Christian, Hunter, Ryan (our cousin) and me. Ryan and Hunter got Baptized together at the Baptism Pier after they were born, by our Grandaddy Walt. He Baptized us there first. Q: What do you do with the money you make from The Baptism Book. Q: This is such a beautiful song. I want to help somehow. What can can I do? A: Tell your friends. Buy a copy of The Baptism Song book for them. Sing it. We hope that the passion, beauty and simplicity of The Baptism Song will open doors to people's hearts. Q: Can I use The Baptism Song in a movie that I am making? A: That would be exciting. You will have to talk with daddy about that. Send him an email below. Q: Can you sing The Baptism Song at our Sunday School and show children The Baptism Song Book? Special thanks to: Uncle Andy & Uncle Scott, Uncle Russ, Uncle Buttercup, Uncle Matt, Aunt Tammy, Ben, Ryan, Aunt Paula & Uncle Mike, Caroline, Rebecca, Aunt Kim & Uncle Dave, Michael, Aunt Dolores & Uncle Mark, Lauren, Nick, Sarah, Aunt Katie & Uncle Jeff, Michael, Allison, Aunt Julie & Uncle Ron, Rachel, JT Torres, Glenn Nelson, Jenny & Ed, Carlie, Andrew, Abby & Special thanks to Hilda Gore and Rachel G. Miller! Thanks to the man who does more than all of us combined - Stew Smith. The Baptism Song is registered with the United States Copyright Office HERE.